Earlier that day I drove past the restaurant where I was supposed to be meeting Girl Next Door. With alarm I noticed the chairs were upturned on the tables and the doors were closed. That necessitated a last minute change and I hurriedly consulted my "To eat" list. And that's how we ended up at Little Turtle Thai in Enmore. 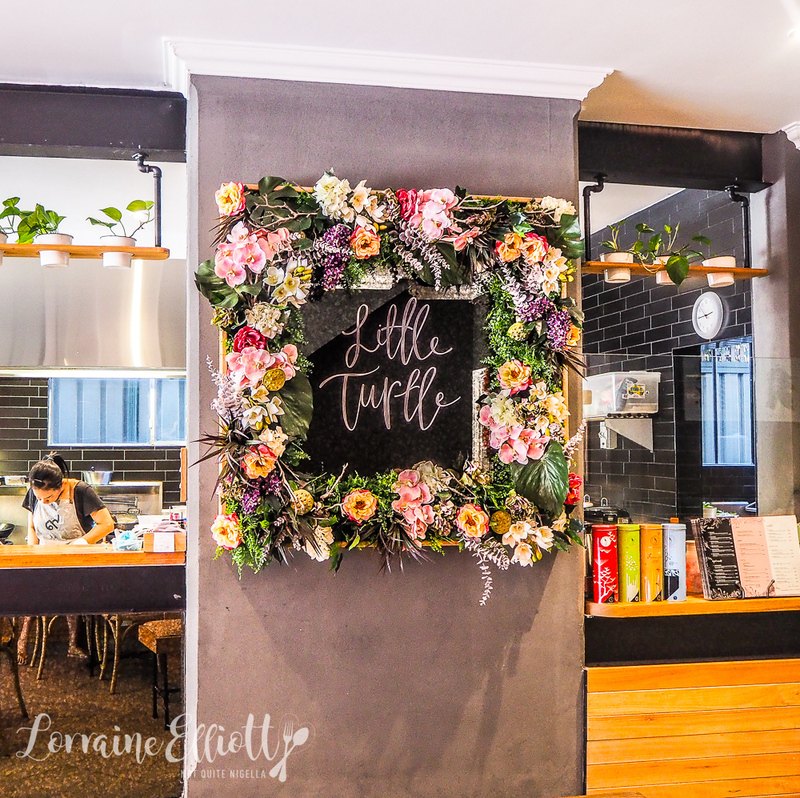 The person behind Little Turtle Thai is 20 year old student Vinita Chumsri who comes from a family that runs Thai restaurants. 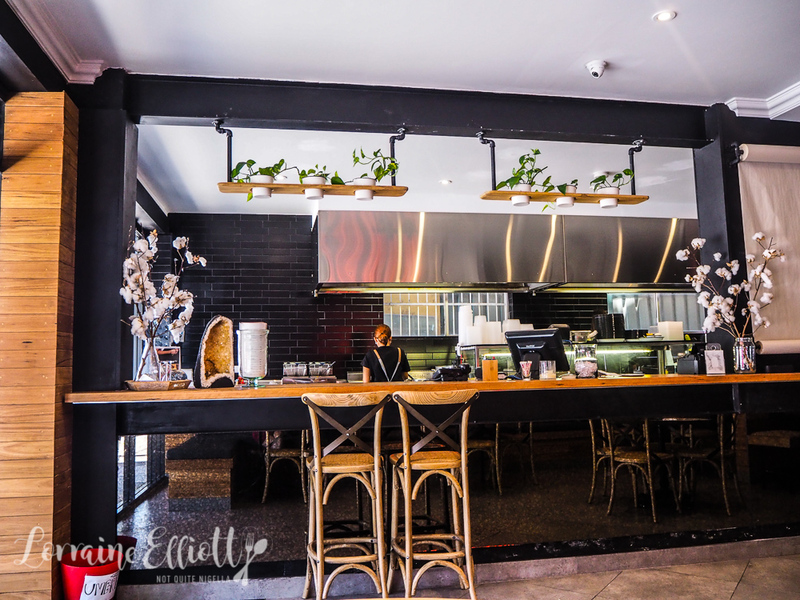 She asked her parents to open a vegan Thai restaurant but she ended up opening one instead. It was part of her recovery process from an eating disorder. The restaurant doesn't look like much on the street. Mr NQN and I had driven past it a few months ago and it's sort of in the middle of not very much else apart from residential houses. But once you take a closer look inside it's a pretty, Instagrammable sort of place courtesy of a floral frame and a neon saying "You are what you eat". 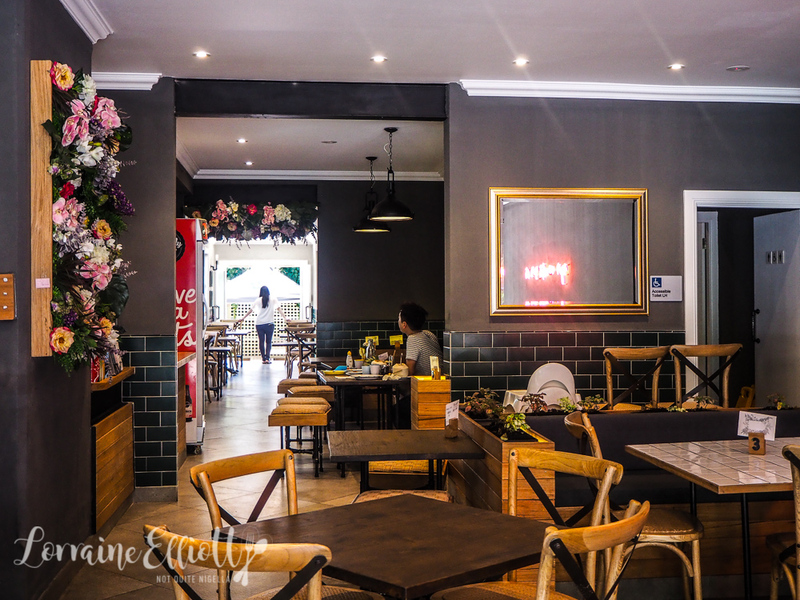 There are spacious tiled tables and banquettes and service is friendly and helpful. 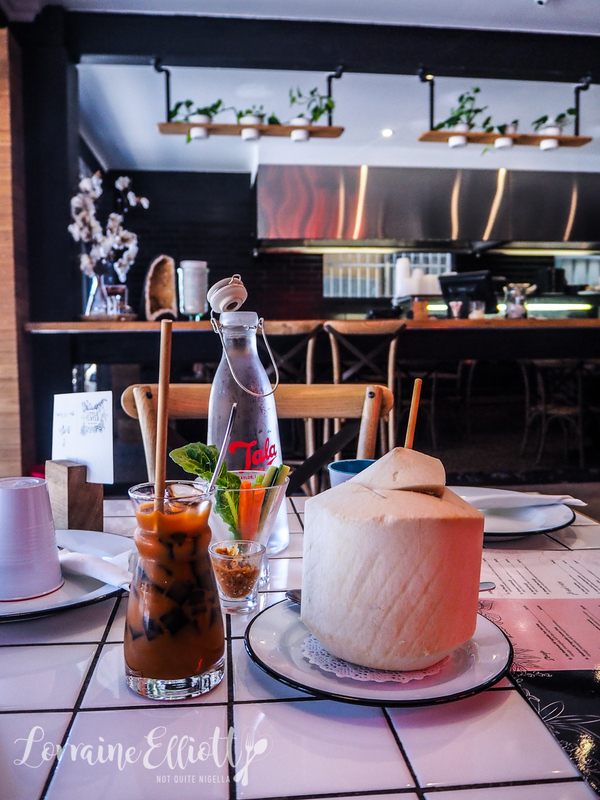 We start with drinks, a delicious and not too sweet Thai milk tea with tapioca noodles for me and a fresh, sweet coconut juice for Girl Next Door. Our waitress recommends some dishes and GND and I have our eyes on exactly the same dishes so ordering is easy. They bring some crudites to the table of celery, cucumber and carrot sticks with a spicy chilli dipping sauce. 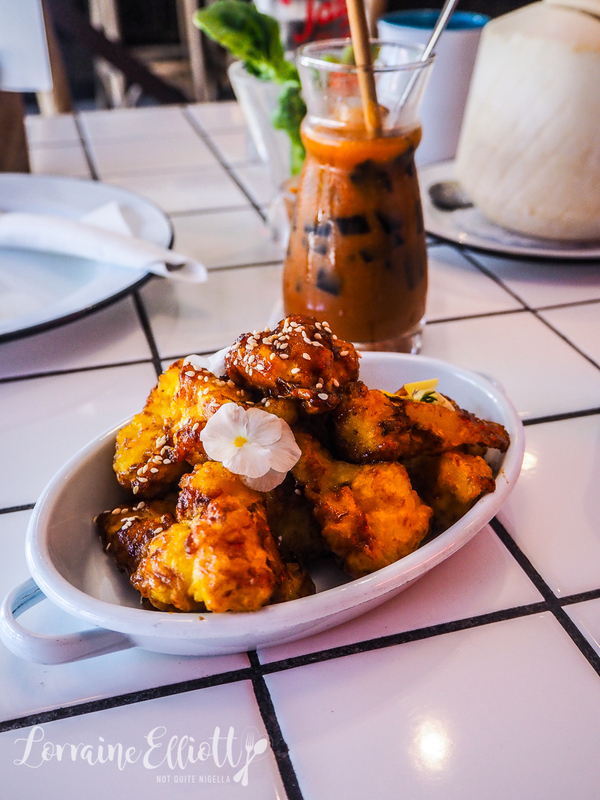 Their signature starter are the sticky sesame wings. These are cauliflower florets that are very lightly battered and coated in a sweet, sticky soy based sauce and sprinkled in sesame seeds and aren't greasy at all. They're moreish and GND can't resist them and I find it hard to pace myself knowing that we have ordered quite a bit. 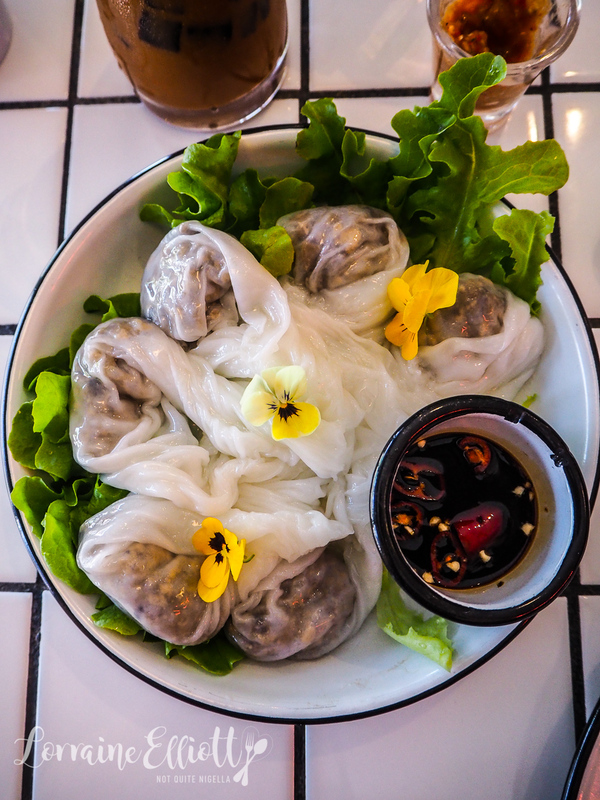 I wasn't sure what to expect with a crepe dumpling but these are gorgeous semi translucent rice flour dumplings filled with mushroom, tofu and asparagus with a black vinegar and chilli dipping sauce. They're full of flavour and it's dishes like these where you almost forget that you're eating vegan because the flavours and textures are satisfying. 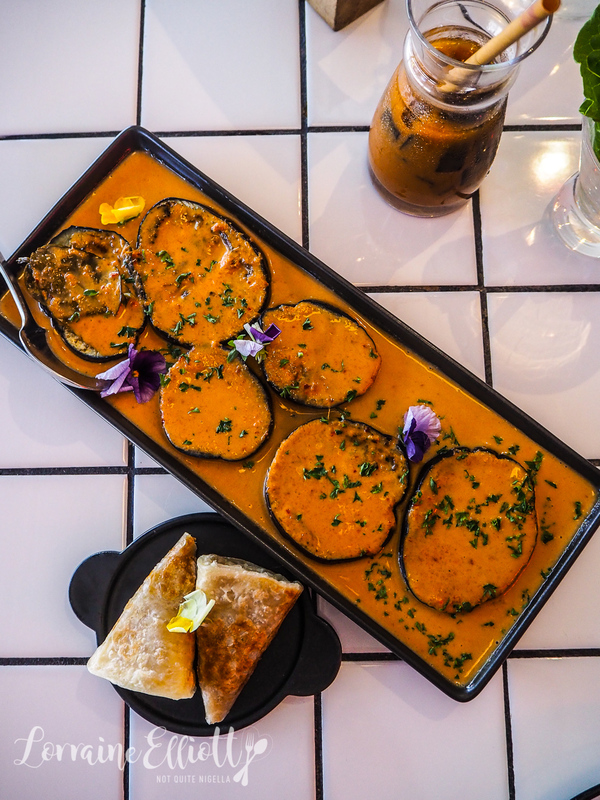 I like the sound of anything caramelised and this eggplant curry comes out on a long rectangular plate with discs of soft eggplant with a nice caramelised edge to them. The Panang curry is a sweet, creamy curry with plenty of lemongrass and kaffir lime leaves. You can have this either with roti or coconut rice and we order both with it. It goes particularly well with the coconut rice but the disc of layered buttery roti is also good for scooping up that delicious sauce. We wanted to get something from each section and because I'm obsessed with noodles we decided on a noodle. 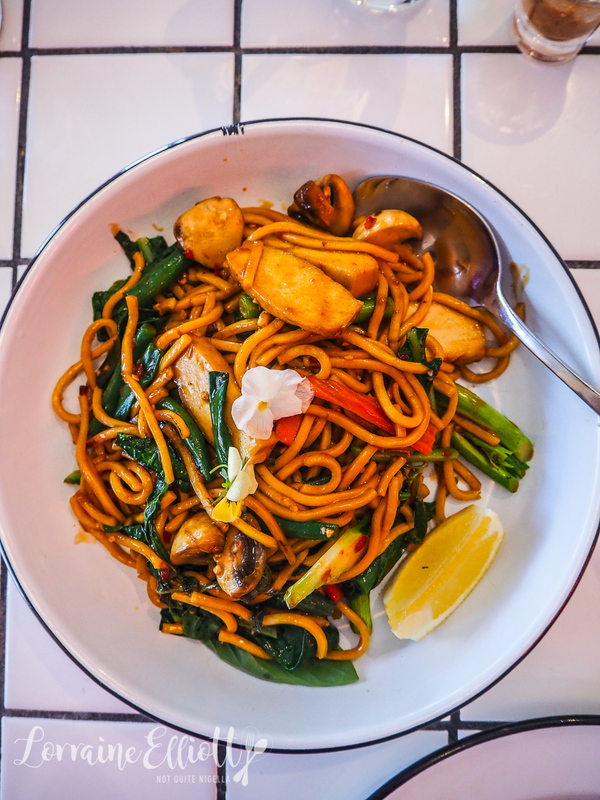 The drunken hokkien noodles are saucy and fried with greens, mushrooms, carrot and tofu chunks. The food does come out one dish at a time so it's not really the place for a quick, rushed lunch. You'd think that with two girls and four dishes there wouldn't be enough room for dessert. But you know me right? Our waitress shows us the dessert specials via the ipad (I always appreciate knowing what dishes will look like). I know Mr NQN will be gutted that he is missing out on mango sticky rice. 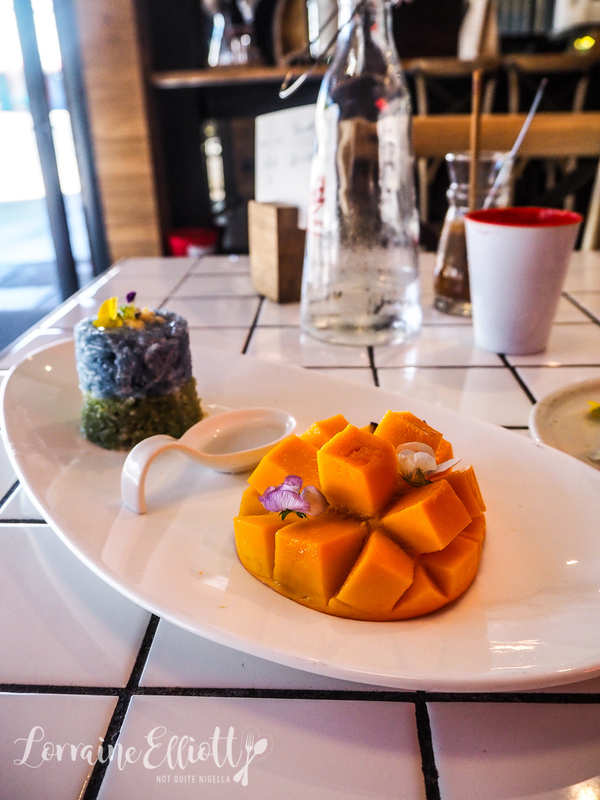 It's a large, fleshy mango cheek with a pot of coconut milk and some sticky rice coloured using natural colours like butterfly pea and pandan. It's delicious and I wish I had more room to finish it. I'm a gal with simple tastes (don't laugh) and for me nothing beats this simple rice flour dumpling dessert. 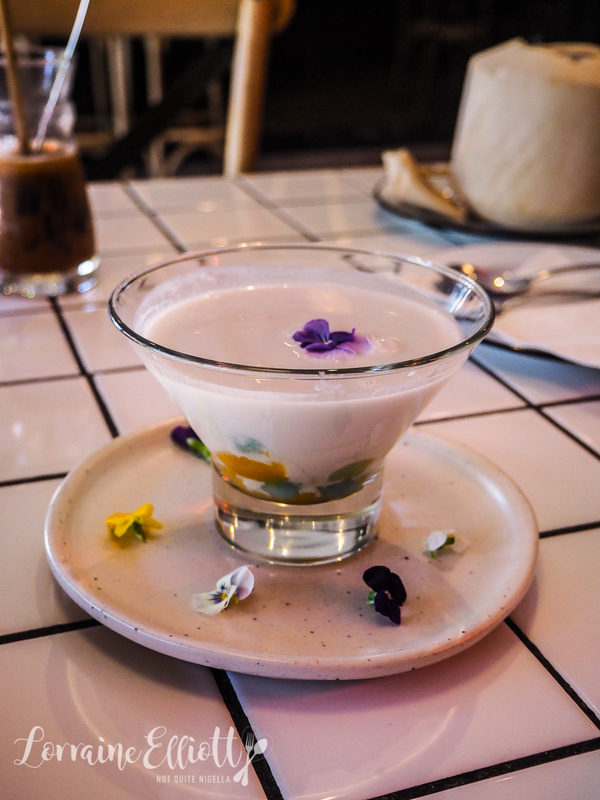 It's sweetened coconut milk with butterfly pea, pandan and pumpkin coloured mochi balls served soft and melting in the mouth with shaved curls of coconut meat. And we haven't missed the meat in our meal at all! So tell me Dear Reader, do you like the same dishes as your friends when you're deciding on what to order? And do you like to see what the dishes are going to look like before you choose? 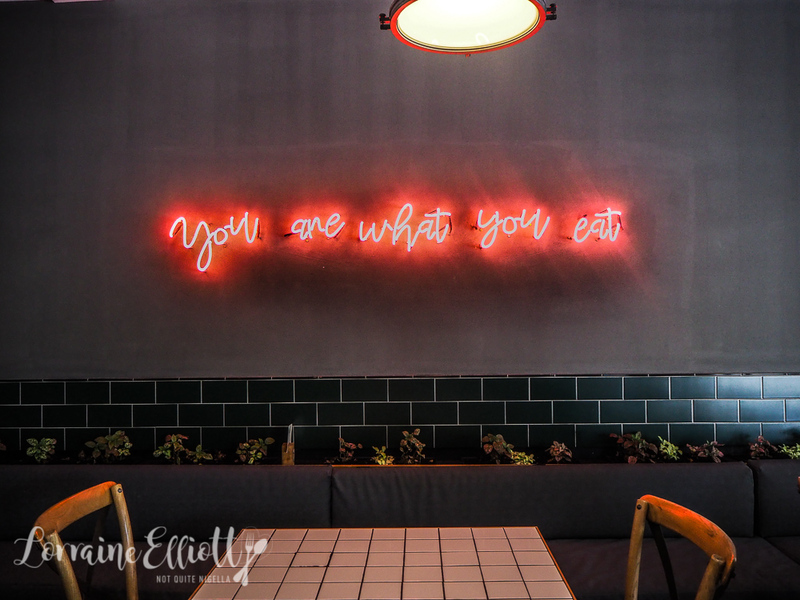 restaurant4 FANTASTIC Vegan Places That Even Non Vegans Will Enjoy!